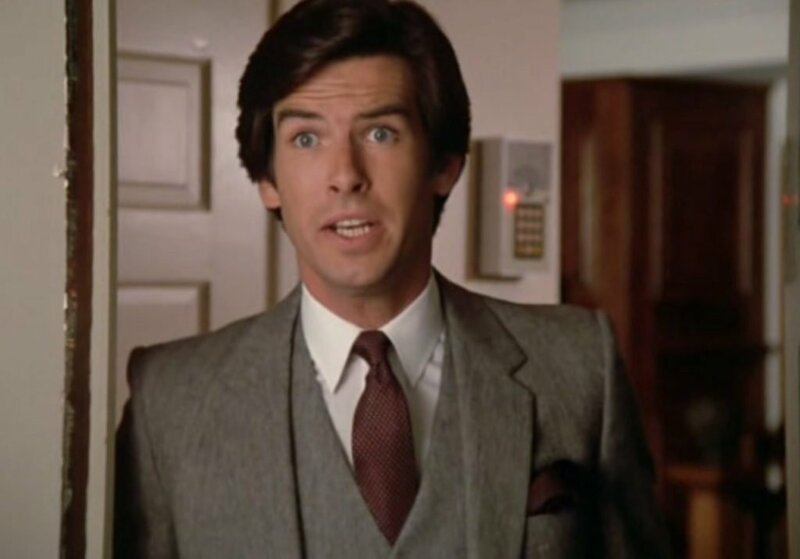 Pierce Brosnan’s elegant suits in Remington Steele gave him his Bond-like image over a decade before he premiered as James Bond. 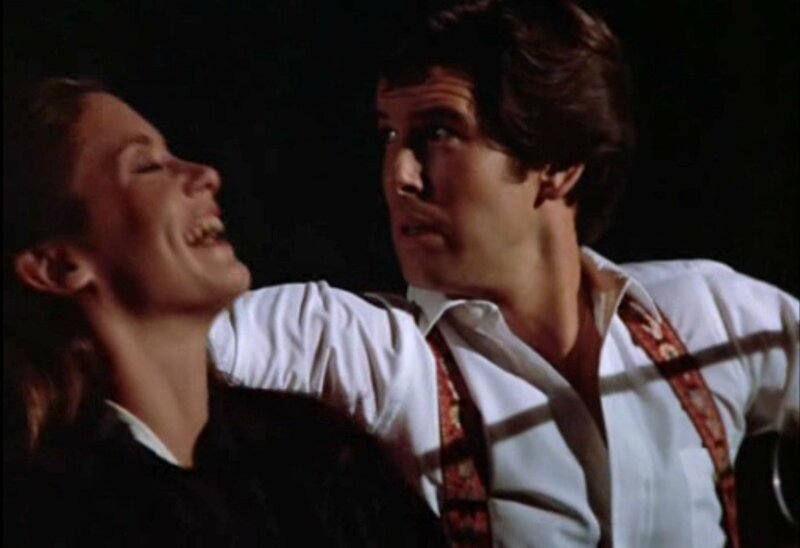 In the 1983 episode of Remington Steele titled “Love Among the Steele”, Mr. Steele acquires the 1936 Auburn Speedster that he drives throughout the rest of the series. 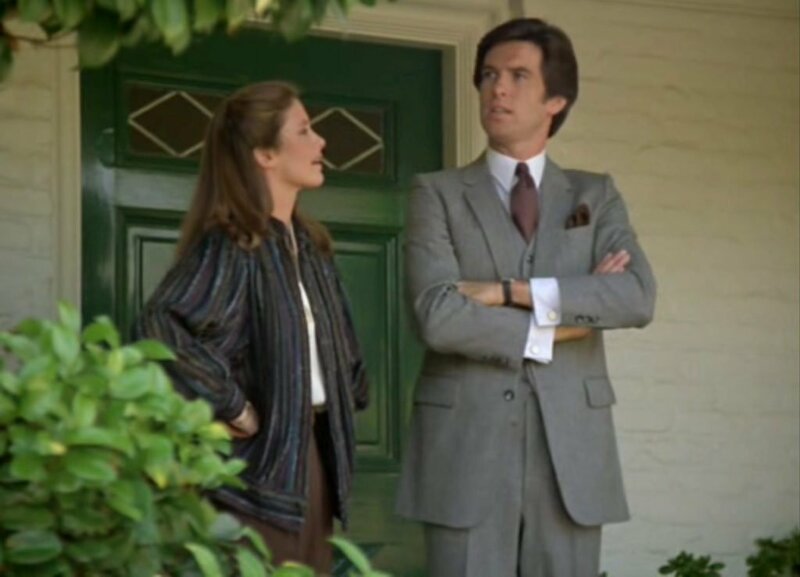 Pierce Brosnan has to look like a man who belongs behind the wheel of this American classic, and for this episode he wears a slightly sporty worsted black and white herringbone three-piece suit that looks grey overall. Sean Connery wears a similar grey herringbone suit in You Only Live Twice. 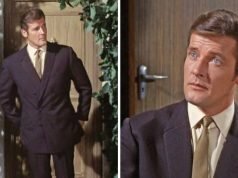 Though this suit is in the style of the suits that Brosnan wears at the beginning of the first series, the suit only appears in this second series episode. The button two suit jacket is cut with a clean chest, a suppressed waist and a flared skirt. The shoulders are well-padded but narrow with a pagoda shape and roped sleeve heads. The jacket is detailed with three buttons on the cuffs and flapped pockets. There is a deep single vent in the rear that gives the suit a sporty look. 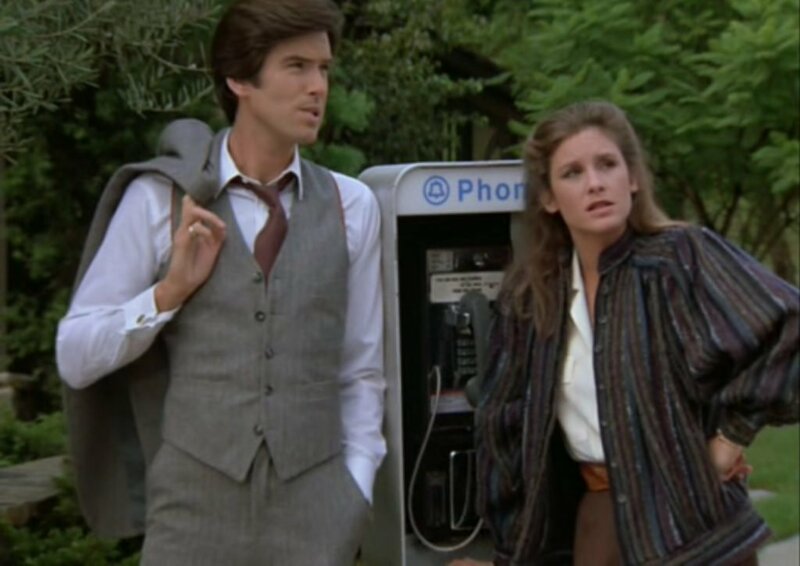 This may be the only suit that Brosnan wears in Remington Steele that has a single vent; his suit jackets always have double vents or no vent. The notched lapels are a medium width and have steeper and lower gorge (notch) than what is common today, but the gorge isn’t extreme and does not make the suit look dated. 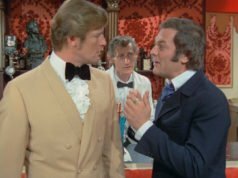 The suit’s waistcoat has five buttons, and Brosnan leaves the bottom button open. There are four welt pockets on the front, and the back is made in a grey lining material. The suit’s buttons are grey and black urea, which is imitation horn. The suit trousers have a flat front and wide, straight legs. They are trimmed with slanted side pockets, a button-through welt pocket on the left rear, an open welt pocket on the right rear and belt loops. But even though there are belt loops, on this rare occasion Pierce Brosnan makes the right choice to not wear a belt with a three-piece suit. A belt prevents the waistcoat from laying neatly over the trousers. Instead of a belt, Brosnan wears braces to keep up his trousers. The braces are red in the 1980s fashion and have a printed floral motif. They stick out of the waistcoat’s armholes because the shoulders are cut so narrow on the waistcoat. With the suit, Brosnan wears a white shirt of American origin. 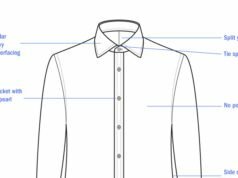 It has a medium-short point collar with tie space, rounded double cuffs with centred link holes, a front placket and an open breast pocket. The collar, cuffs and placket are stitched 1/4-inch from the edge. Because Brosnan wears both a waistcoat and braces over the shirt, the breast pocket is completely unusable. With the waistcoat off, braces draw attention to the out-of-place breast-pocket. The outfit is accessorised with a tie in a small burgundy and pink neat pattern that resembles a chequerboard. He wears a maroon puffed silk pocket square that pulls out the darker colour in the tie, though it’s not an exact match. Brosnan’s shoes are well-polished black cap-toe oxfords. The early 80s had a good,elegant classic style,before of the incomprehensible success in USA of the Armani’s garbage. I couldn’t agree more; My suspicion is that Armani’s shapeless, colorless outfits catered to people who wanted to feel “fashionable” without taking the trouble to learn about cut, silhouette, or color coordination. However, to be fair, Armani put Christian Bale in some decent suits in Chri Nolan’s Batman trilogy. I work for a men’s tailored clothing manufacturer that made some of the suits for the series. I cut three of them and it was exciting for me at the time. Thank you for bringing this memory back.